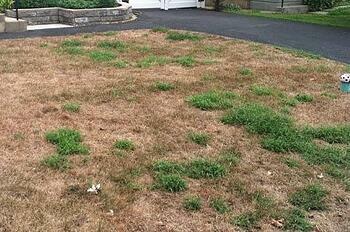 A gorgeous healthy lawn isn’t just attractive to people. It’s also one of the favorite meals to various insects in Allentown, Bethlehem, Easton, PA and surrounding areas. 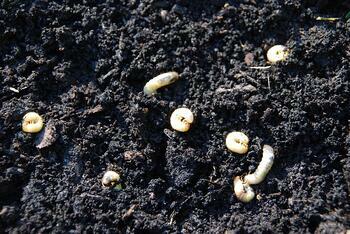 Lawn pests such as grubs and chinch bugs can destroy a beautiful lawn in just a short time. This is the reason lawn care companies often perform lawn insect control services to turfgrass to prevent this damage from happening. These treatments can be applied preventatively to keep your lawn from developing the brown and dead patches that can result from these pests. The larvae of Japanese Beetles and a few other related species, grubs are found below the surface of your lawn and feed on the roots of grass plants. The sad reality is that most homeowners don’t know they have a grub infestation until irreversible damage has already happened to their lawn. However, applying a preventative grub control treatment each year will ensure season-long control over these highly destructive pests. Our grub control treatment is guaranteed, so you can rest easy not worrying about large areas of your lawn being completely destroyed. These tiny insects are found in the thatch layer of your lawn, just above the surface. Chinch Bugs feed on the grass blades and crown (part connecting to root) and when in high numbers, can also destroy large areas of turf. These lawn insects are extremely hard to spot, as they are smaller than ⅛“ long. Chinch Bug Control treatments should be applied when these pests are active from late spring and into summer. This material will drastically reduce populations so your lawn can continue to grow without being damaged. Since these pests are hard to spot before the damage is done, we highly recommend scheduling these treatments before it’s too late. Some of Joshua Tree’s lawn care programs include proactively scheduled lawn insect control treatments. Having a comprehensive lawn care program means you can be sure your Grub Control and Chinch Bug Control treatments are happening at the ideal time. Our highly-skilled and experienced lawn care experts would be happy to inspect your lawn and make recommendations for keeping your lawn healthy from insects and other threats. Feel free to check out examples of lawn care pricing and when you’re ready to learn more, feel free to contact us for a free estimate.